NASA scientists have announced a surprising discovery: the Kepler-90 system actually has eight planets and not the seven that it was thought to have. The new planet, called Kepler-90i, is the third one that revolves around the Keppler-90A star. The Kepler-90i is a rocky planet 30% larger than Earth. It is so close to its star that the temperature on the surface exceeds 400 ° C, as in Mercury, the planet closest to the Sun in our system. The fact of being so close to its sun also means that it has a shorter orbit: it completes one turn round the sun every 14 days (it takes 365 days). If we lived there, we would celebrate our birthday every two weeks! 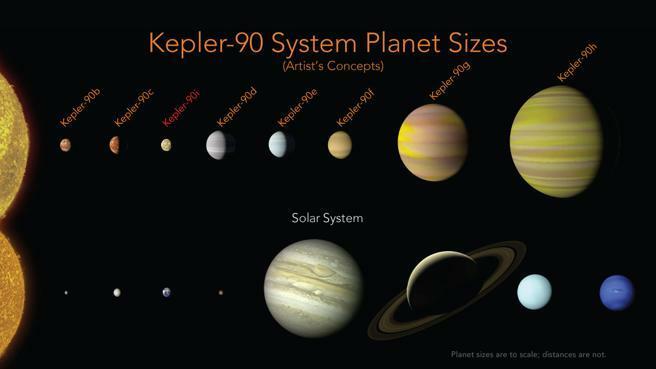 Now that we know that it has eight planets, the Kepler-90 system is the closest to our Solar System. Even so, the planets of Kepler-90 are closer to each other, so their orbits are shorter and take less to complete a turn. Right in the center of this system is the star Kepler-90A, which is part of the Draco constellation, 2,545 light-years from Earth. The first seven planets were discovered in 2013. Its name is due to NASA’s Kepler space telescope, which travels through space looking for new stars and planetary systems. So far, thanks to the Kepler telescope, the existence of 2,341 exoplanets has been confirmed, thirty of which could be habitable. How is a planet discovered? The discovery of the Kepler-90i was discovered thanks to the Kepler telescope and AI (Artifical Intelligence) developed by Google. In recent years thousands of exoplanets have been discovered that revolve round other stars in our galaxy. Although we can’t see them, their existence is deduced through concealment, when the brightness of a star changes that is because a planet is passing by. The probes that sailing through space and the telescopes that scan the universe provide us with a great deal of data: stellar movements, changes of light … And this is where Google’s “machine learning” comes into play. Scientists Christopher Shallue and Andrew Vanderburg have trained Google computers to learn how to detect changes in light and other anomalies reflected in the data, they have been taught to compare this and, as a result, know if they have discovered a new planet.